The button show is this weekend! Yay!!! 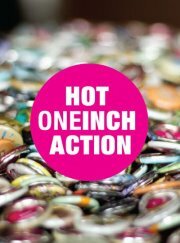 One of my all time favorite art shows of the year, Hot One Inch Action refers to the 1 inch buttons or pins that are created from the artwork of 50 lucky contributors. The number of submissions they get grows each year and it can be super competitive to have your art accepted. As an artist, it’s also tough to decide what to submit – just because a piece is really beautiful, doesn’t mean it will necessarily translate well to the tiny size. I’m happy to report that I will have one of my own buttons in the show – my Captain Steve painting from the Bill Murray show looks super rad as a button. The best part of this show is that unlike most traditional art shows, you can’t just look at the art on the wall & buy your favorite. No, no! For $5 you can purchase a COMPLETELY RANDOM bag of 5 buttons. So if you didn’t get your favorite? Well, now you gotta talk to the other attendees & try to make a deal. It’s one of the few art shows where everyone talks to everyone because the only way to get the buttons you want is to trade for them. It’s always fun to see which ones are in hot demand too. Tip: each artist gets an extra bag of their own buttons. So if you can find the artist who created the button you want, you’ve got a good shot of making a trade.